This sculpture uses the path of the rolling ball to randomly display words that become part of a story. 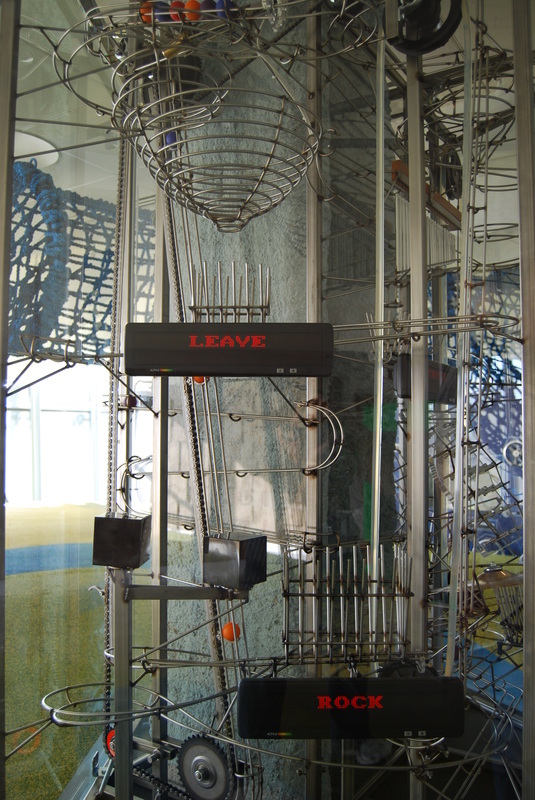 When the lever is pulled, a single ball is released onto the track where it encounters five different obstacles. 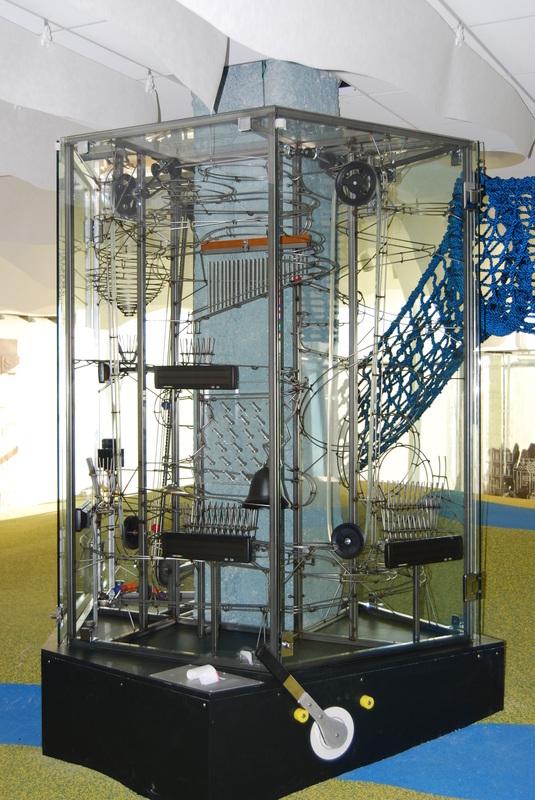 At each obstacle, the ball lands in a basket and triggers the display of a single, random word. At the end of the ball’s journey, the five words are printed on a piece of paper to be used to create a short story related to the theme. This encourages creative thought and reinforces the overall theme related to the Spertus Institute. A custom glass display case wrapped around a structural column of the building. 1-3/8” ball diameter in multiple colors. Two ball lifts: a Chain lift and a Belt lift. A single motor to drive both lifts with an overhead drive-train. Five ball interactions, where the ball passes through a track feature and lands in a basket, triggering a LED display to show a word. A single lever interaction used to initiate the ball’s entry into the path. A small printer to provide a print-out of the five random words. A Storied Path uses the rolling balls to trigger the display of random words to eventually be printed out and used to write a short story. 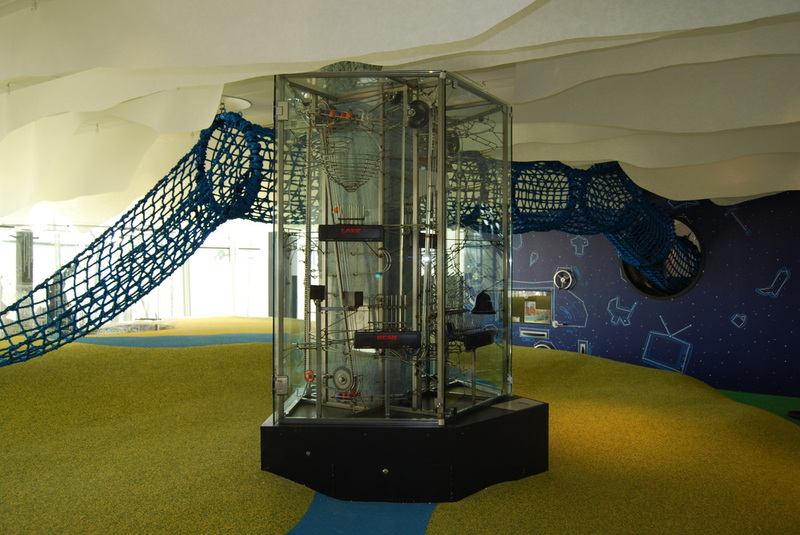 A Storied Path wraps around a structural column in a kids play-area of the Spertus Institute. Five LED displays show random words when balls fall into the baskets mounted above. The words are later printed out and used to write a story.